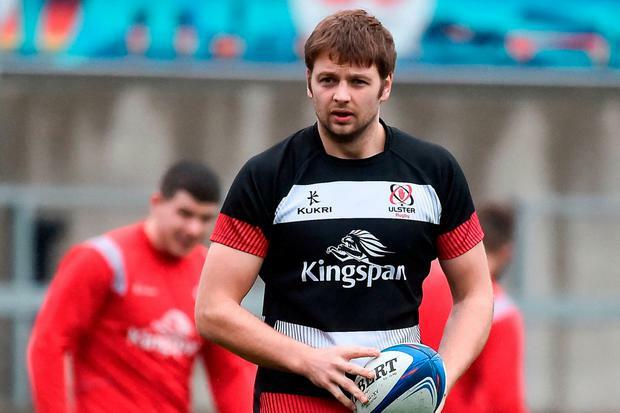 Ulster will give Iain Henderson every chance to prove his fitness in time for Saturday's Champions Cup quarter-final against Leinster. The talismanic lock picked up a knee injury earlier this month during Ireland's Six Nations win over France and hasn't featured since. Henderson was involved in some of Ulster's training session this morning as he looks to accelerate his return. "I think it is a day-by-day thing with him if I am honest," backs coach Dwayne Peel said at a media event at the Kingspan Stadium. "The call will be made on him later on in the week." Marty Moore is following return to play protocols, but is expected to be fit to face his former team. Darren Cave also appears to be winning his race to be fit for the sold out showdown at the Aviva Stadium this weekend as he looks to overcome a rib problem, but Louis Ludik (knee) will definitely miss the clash. "Hopefully Cavey will be okay," Peel continued. "Obviously the other one from the weekend who will miss out this week is Louis. We are still waiting on (scan) results from him. "I'm disappointed for him because he has been a big part of what we have done in this competition, he has been good. "He has worked hard to get back from a long-term injury as it was, so for him to miss an occasion like this is tough. I am sure the guys will step up and perform well." Will Addison and Craig Gilroy (both back) remain sidelined.